REVIEW: Supergirl, S4E15 – O Brother, Where Art Thou? About all we saw of poor James in his special ep. The episode opened to the sounds of police sirens and the public’s screams as Lex (played with enough sleazy charm by Jon Cryer that I almost forgot there was no way he was young enough for his role) showed Lena (Katie McGrath) the horror and power of a red sun. The elder Luthor sibling was quite upset about Superman being the Man of Tomorrow on that day four years ago, but that was all just backstory for a furlough visit to his little sister. And the fact that he wanted Lena to use her untested drug to cure him of the cancer currently killing him was not just backstory, but a flashing sign that he was behind James being shot. Speaking of James, Kara (Melissa Benoist) arrived in time to rush him to the hospital where all the major Supergirl players quickly gathered to show their support. 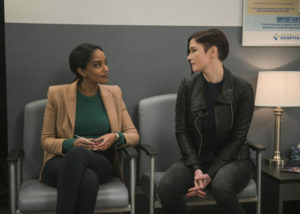 The incident gave us a long-awaited moment between Kara and Lena, but more importantly it introduced us to another new character: Kelly Olsen (Azie Tesfai). While she was tasked with making medical choices on her brother’s behalf, Alex (Chyler Leigh) was busy trying to convince her and Lena both that the best course of action was to bypass modern medicine and just inject him with the Harun-El serum. While I appreciated how real the stakes felt in “O Brother, Where Art Thou?”, I’m not sure I buy that she would have the biggest personal stake in James’ survival. It was doubly strange when Kara was called out as his best friend but went with J’onn to track down Manchester instead, especially since there was no real proof that Manchester was behind it. But Manchester was guilty of breaking into J’onn’s mind, stealing the staff of H’ronmeer, and burning his father’s grave. He then proceeded to use the two-way psychic link to his advantage by forcing J’onn to relive the death of his daughters and even the potential death of his adopted daughters. It was all a cautionary tale regarding J’onn’s peace treaty with himself, but Kara reminded him that his presence was enough to give her and Alex strength. Her absence, on the other hand, was wreaking havoc on Alex’s already fragile state. When the elder Danvers called to demand answers, Kara was forced to act as if she was on assignment as a reporter. Of course, Alex saw through that excuse, but it’s unclear if this will make Kara tell her the truth any faster since they patched up their misunderstanding by the end of the hour. Back to the sibling duo at the center of “O Brother, Where Art Thou?”, Lena worked alongside her brother to make the cure safe before it was too late to save James – except both Lex and James kept getting worse by the minute. While Alex worked on getting Kelly to agree to the drug, Lex worked on convincing Lena to be by her ex’s side. First, we learned that she dumped him in the first place because she felt guilty about Lex pulling strings on her behalf. Next, he gave a powerful speech about Lena’s inner goodness that involved their respective mothers and Lex’s dog. The day his dog died, he was sent away on a business trip by Lillian, where he met Lena’s mother. She gave him a hug and showed him that people could be kind, which he saw reflected in Lena herself. It was an unbelievably sweet moment, mostly because it was part of Lex’s plot from the start. It was a plot he unveiled nearly the second that Lena successfully saved James with the Harun-El serum, though he might have kept quiet if she hadn’t caught on to his game. If having the presumed-dead Otis Graves (!!!) shoot James wasn’t enough, he revealed that his brotherly manipulation went even further back: Eve Teschmacher, to no one’s surprise, was secretly his mole the entire time. Cold-blooded Eve was even willing to kill her boss, but Lex declared himself too good of a sibling to do such a thing. Har har har. Relationships and intense circumstances, hmm? The best sibling award belonged to Kelly Olsen, who remained calm and collected throughout the ordeal and only consented to a highly experimental drug when there was no other option because Manchester had short-circuited the city’s power. She impressed Alex, thanked Lena, and even called Mama Olsen who tattle on her danger-loving brother. In conclusion: we stan. What we might stan a little less is the pacing of “O Brother, Where Art Thou?”, which was juggling a few plots too many. Not only did James nearly die and get resurrected so that Lex could save himself from cancer before taking out National City’s entire SWAT Team Thinker-style, but J’onn finally gave into his dark side and offed Manchester with the very weapon Black stole. Meanwhile, Nia (Nicole Maines) kissed Brainy (Jesse Rath) to save him from his own traumatic analyses just to get rejected because Keanu Reeves’ character in Speed said relationships built on intense circumstances never last. Not sure where Supergirl is going with that ship, but if they need my permission before they let it sail then that have it. “O Brother, Where Art Thou?” may have been something of a mess narratively, but it set the scene for a lot of important plays in the near future. Hopefully the show follows through.